For events such as concerts, sporting occasions, festivals, parties, and so on, you’ll need portable restroom facilities. And nowadays, the world of portable restrooms has been revolutionized to provide it’s customers with so many different options, varying from your basic plastic single stalls to the luxury restroom trailers which are equipped with several additional amenities that cannot be found in the standard, common, plastic models. These trailers are often used for classier events, or when more important guests are expected to attend. 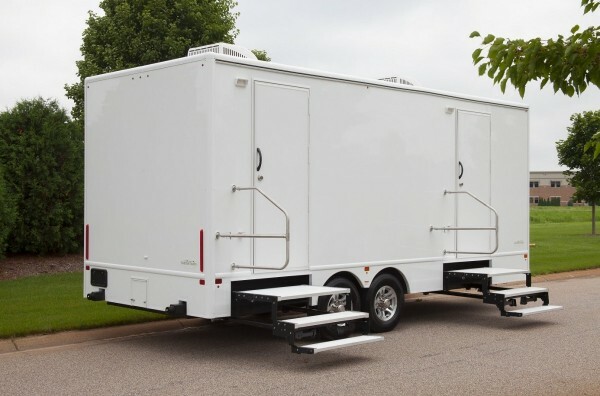 When a host wants to take an extra measure to create a welcoming environment, luxury restroom trailers are usually rented for the function they are putting on. Now, most portable restroom companies will offer different varieties of luxury trailers with various features. Each exterior and interior is unique to the company’s uniform design. However, in and on most luxury trailers, there are standard features that can be expected. One of the most common frills on modern day luxury trailers is the lighting. On the exterior, there are usually miniature LED lamps on the walls outside the door. On the interior, there are ceiling LED lamps as well as occasional digital lights on the door to indicate occupied/vacant. Often times, these restrooms will include vanities with mirrors which are lit with LED lights as well. Chic and sleek paint schemes are another nice feature in these trailers. The bright and clean LED lighting in the trailer will usually accent and compliment the neutral and fresh colors on the interior. Faux wood flooring and white faux crown molding provides beautiful and minimalistic borders inside as well. The air flow in these luxury trailers is so much more efficient than in standard port-a-potties. Usually air conditioning and heating is provided in the interior and vents are installed either in the floor or ceiling (or both) to promote optimum airing options. Sometimes the trailer is built with windows to promote circulation of air as well. Luxury restroom trailers are usually identified by having multiple, individual stalls with doors and locks. Each stall resembles a very small individual room and has china toilet stools with the foot flush option. Last, but not least, another leisurely amenity in these trailers is the vanity area. Whether the area is lit by overhead lighting or mirror border light bulbs, the vanity area usually has mirrors, stainless steel or porcelain sinks, hot/cold faucets, soap dispensers, and trash receptacles. So, whether you’re pondering the option of the luxury restroom trailer for your next event or not, you can see that these facilities are well-developed and well-crafted for your more superior and high-class occasions. They will accommodate you and your guests very well and provide a cleaner, more classy environment.